A campus meetup for UC Riverside student innovators to discuss their ideas with like-minded peers and mentors, and learn about prototyping. 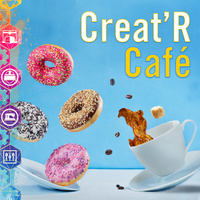 Creat'R Cafe will serve coffee and doughnuts once a month on the first floor of Orbach Library in the Creat'R Lab. This is an opportunity for students to describe their innovation or idea and what challenges they are having. How can Creat'R Lab help? Creat'R Cafe provides an opportunity for attendees, including mentors, to provide advice. Want money to build a prototype? Creat'R Lab has funds of up to $500 per innovation to pay for prototyping the innovation - apply after presenting. Applicants will pitch to EPIC - OTP - RED mentors for the $500 funds. Successful prototypes will be invited to I-Corps with an additional $3000 for customer discovery.